Well, what do you know! My last post suggested I might find Dr. Lee living near Herkimer, NY around 1880. Once I had an idea where she might be, it didn’t take long to locate her in the 1880 census. This is why it is important to spend time tracking down other types of resources when doing family research. The contents of news clipping for the Kanistanaux family have provided many vital clues about the people in the family, their connections to each other, and where to look for missing pieces. I found Dr. Lee in the 1880 census using Ancestry.com. First, I selected Census, then 1880. In the search box I entered Herkimer Co., NY as the “Lived In” location and used the setting “Restrict to Adjacent Counties”. The only other item was setting “Indian” as the race. I did not use any names, since I have already done name searches that did not discover her. What do you know, there she is on the first page of results in Rome, Oneida Co., NY. If only they were all that easy. Oh wait, this wasn’t easy. It took me and Randy hours and hours of searching old newspapers to find the bits and pieces that brought me to this point. If she had been listed as white instead of Indian, it would have taken much longer to find her! The word “Native” seems to be written in a different hand and appears to be the same hand that placed the initials EHS in the right hand margin. Really not sure what that might be all about. A few other items in this different hand appear on the page. There is another widow under the same roof, 47 year old Phoebe Fox of Canada with her 7 year old son born in Illinois. They are not identified as Indian. There is no way to tell if they are related or living in separate apartments. Dr. Lee is a 50 year old widow this year. Hmmm, wonder if Isaac knows he is dead! And an extra Hmmmmmmm when I think about her age. This lady makes my head hurt!!! No matter how many times I look at it, the census still says her age is 50 and it is crystal clear. This puts her birth year at 1830. That’s sixteen years earlier then the earliest (of the many and varied) birth years collected so far for this lady. I have learned from experience that census ages are seldom accurate. True, I have followed people through the census and seen their ages be dead-on decade after decade. However, variation from decade to decade is more common. Women seem to be more susceptible ;-) A ten to fifteen year spread is nothing to get too worried about. As a rule of thumb I tend to use the age given for a child as being the most likely to be close to the truth. Notice, how I worded that? I’m still not giving any census age much trustworthiness. In Dr. Lee’s case I tend to think the 1870 Census age might be the most reliable and easiest to analyze of those I have. She is recorded as 24 years old this year. This places her in the category of young adult, which is something most people would recognize. A 14 year old might be able to pass as a young adult. A 39 year old might be able to pass for a young adult today, but life was physically much harder on people 140 years ago and good cosmetics not so common. Perhaps a 34 year old could still pass for a young adult, but I really don’t see a 40 year old woman passing as a young adult in 1870. Using this “system” provides a rough birth year range of 1836 to 1856. Of course this is all speculation based on the physical appearance of a young adult. When I review all the documents that have age information for Dr. Lee, I find a birth year range from 1830 to 1870, a spread of forty years. This is by far the biggest range I have ever come across for census age variation. How could this not be two different people? But alas, with the exception of age, the current evidence suggests there is only one. I really don’t see how this Dr. Lee-o-netto in Rome could be any other woman than the one I have been tracking. So where does this leave me when trying to figure out how old she really is? — Very confused! If she was really born as early as 1830, she could not be a daughter to Marleah, who was born about 1825. So, how should I deal with that?!? Am I back to thinking she may be a sister to Marleah? 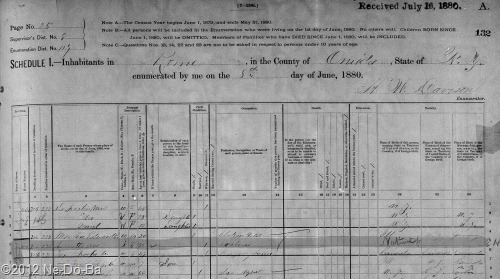 Or maybe I should just write this 1878 age off as census taker error. But what if it’s correct?!? I’m pretty sure she was born in Canada, but that’s a pretty big place, and it may have been New York or some other place – sigh. I have a birth year range of 20 years at best and 40 years at the worst. At this point I still have no idea who her parents might be or what her birth name is. How will I ever locate a birth record? It takes lots and lots of patience to be a successful genealogist – big sigh. I guess the hunt for more records is still on.